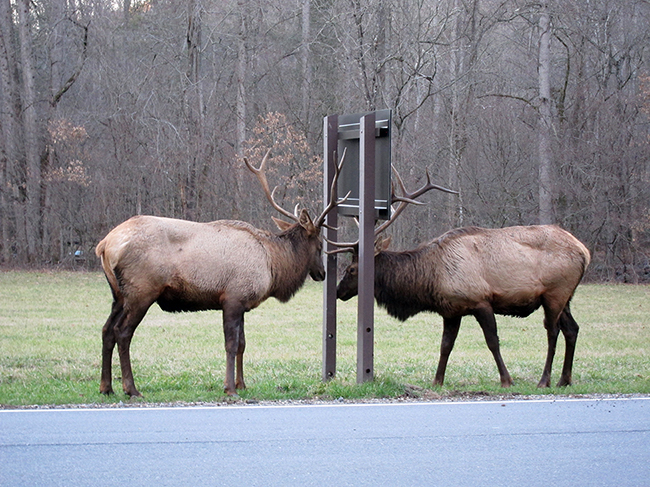 GATLINBURG, TN - Great Smoky Mountains National Park officials remind park visitors to exercise caution as they view and photograph elk to protect both the animals and themselves. Elk have entered the fall breeding season, known as the rut. As a result, from September 1 through October 31, fields in Cataloochee and Oconaluftee are closed to all users. Even when elk are not present, people are not allowed to walk into the fields. Visitors are encouraged to use binoculars, spotting scopes, or cameras with telephoto lenses to best view and photograph wildlife. Feeding, touching, or disturbing any wildlife, as well as willfully approaching bears or elk within 50 yards (150 feet)--or any distance that disturbs or displaces wildlife--are all illegal in the park. If approached by an elk, visitors should slowly back away to create space for the animal to pass. If viewing elk near roadways, pull completely off the road, and remain in or next to your vehicle at a safe distance from the animal.